We are providing the instructions below based on our experience installing GHC and other software in late 2008. Installation instructions inevitably become dated quickly; please bear this in mind as you read. The prebuilt binary packages of GHC should work on Windows Vista and XP (even Windows 2000). We have installed GHC 6.8.3 under Windows XP Service Pack 2; here are the steps we followed. On Windows, GHC requires about 400MB of disk space. The exact amount will vary from release to release. Our first step is to visit the GHC download page, and follow the link to the current stable release. Scroll down to the section entitled “Binary packages”, and then again to the subsection for Windows. Download the installer; in our case, it's named ghc-6.8.3-i386-windows.exe. After the installer has downloaded, double-clicking on it starts the installation process. This involves stepping through a normal Windows installer wizard. Once the installer has finished, the Start Menu's “All Programs” submenu should have a GHC folder, inside of which you'll find an icon that you can use to run ghci. Clicking on the ghci icon brings up a normal Windows console window, running ghci. The GHC installer automatically modifies your user account's PATH environment variable so that commands like ghc will be present in the command shell's search path (i.e. 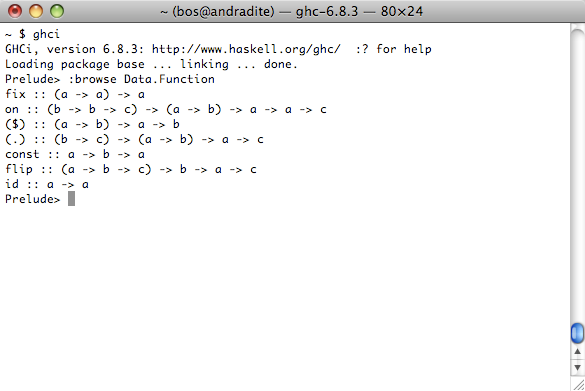 you can type a GHC command name without typing its complete path). This change will take effect the next time you open a command shell. We have installed GHC 6.8.3 under Mac OS X 10.5 (Leopard), on an Intel-based MacBook. Before installing GHC, the Xcode development system must already be installed. The Xcode software installer may have come bundled on a DVD with your Mac. If not (or you can't find it), you should be able to download it from Apple. Once you've finished installing Xcode, continue on to download GHC itself. Visit the GHC download page, and follow the link to the current stable release. Scroll down to the section entitled “Binary packages”, and then again to the subsection for Mac OS X. There is a single installer package available. Download and run it. Terminal at your fingertips yet? Since most of your interactions with GHC will be through a Terminal window, this might be a good time to add the Terminal application to your dock, if you haven't already done so. You can find it in the system's /Applications/Utilities folder. The installation process should take a minute or two. Finally, you should be able to successfully run the ghci command from your shell prompt. Both the MacPorts and Fink projects provide builds of GHC. Under both Ubuntu and Debian, you can install a minimal working version of GHC by running sudo aptitude install ghc6 from a shell prompt. These distros maintain a small core GHC package, which is insufficient for much practical development. However, they make a number of additional prebuilt packages available. To see a complete list of these prebuilt packages, run apt-cache search libghc6. We recommend that you install at least the mtl package, using sudo aptitude install libghc6-mtl-dev. Since you will probably want to profile the performance of your Haskell programs at some point, you should also install the ghc6-prof package. 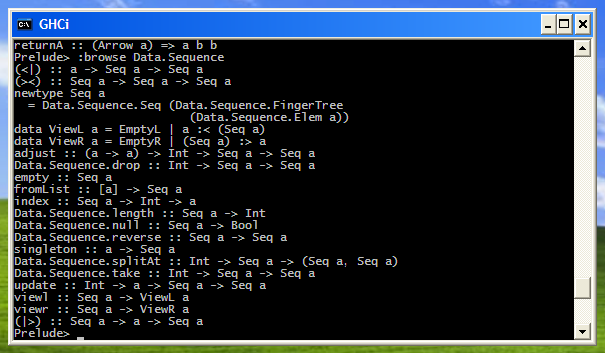 The base package, containing the ghc and ghci commands and libraries, is ghc. The ghc-doc package contains the GHC user guide, and command and library documentation. The ghc683-prof package contains profiling-capable versions of the standard libraries (note: its version number may have changed by the time you read this). 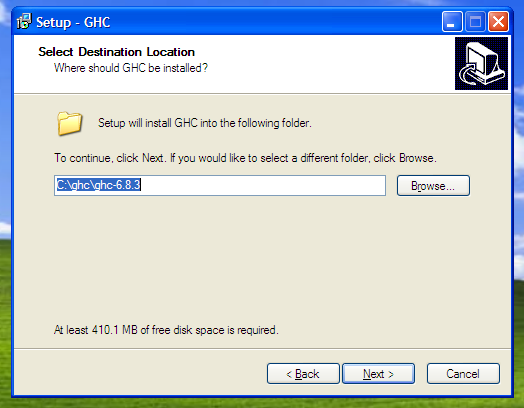 Once installation has finished, you should be able to run ghci from the shell immediately. You won't need to change your shell's search path, or set any environment variables. This will download and build GHC from source. You should expect the process to take several hours. Almost all Haskell libraries are distributed using a standard packaging system named Cabal. You can find hundreds of Haskell open source libraries and programs, all of which use Cabal, at http://hackage.haskell.org/, the home of the Hackage code repository. A command named cabal automates the job of downloading, building, and installing a Haskell package. It also figures out what dependencies a particular library needs, and either makes sure that they are installed already, or downloads and builds those first. You can install any Haskell package with a single cabal install mypackage command. The cabal command is not bundled with GHC, so at least as of version 6.8.3 of GHC, you will have to download and build cabal yourself. Follow the instructions in the section called “Building packages by hand” below to manually build each of the four packages above, making sure that you leave cabal-install until last. After you install the cabal-install package, the $HOME/.cabal/bin directory will contain the cabal command. You can either move it somewhere more convenient or add that directory to your shell's search path. If you build by hand, you will frequently find that the configuration step fails because some other library must be installed first. You may find yourself needing to download and build several packages before you can make progress on the one you really want. This is why we recommend using the cabal command instead.